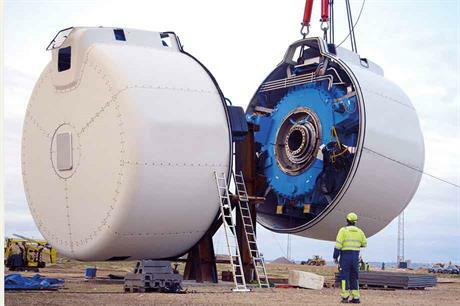 The sector is adapating to higher-rated turbines and changing grid demands. Superconductors conduct electricity almost without resistance, offering an energy-efficient alternative to copper. Vastly reduced material usage has contributed to making superconducting technology competitive with conventional electric machines. The EcoSwing high-temperature superconductor (HTS) is the outcome of an EU Horizon 2020 research and innovation support programme, a four-year project that lasts until March 2019, with nine partners from five countries. German engineering consultancy ECO 5 is responsible for the generator design, for which it claims a 40% mass reduction compared with PMGs. The HTS generator is now incorporated in a 3.6MW direct-drive Envision "modular demonstration turbine" in Denmark. Installed in 2012, it features a two-blade upwind rotor with partial-pitch control and a PMG behind the tower connected via a composite torque shaft. The layout enables "uncomplicated generator switching". The exchange process involved installed power conversion and refrigeration equipment for cooling EcoSwing 40 superconducting rotor poles to -243oC with rotating cryocoolers and compressors. The conventional outer stator consists of high-density copper coils. The goal is to prove that a superconducting drivetrain is cost competitive with a conventional PMG- type generator in real-life generation.